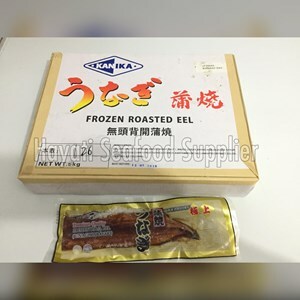 Hayati Fresh & Frozen Seafood as Frozen Food Supplier Jakarta Selling Unagi Kabayaki Import. For those who like Japanese cuisine must know dong Unagi Kabayaki is what. Unagi Kabayaki is an eel fish (a type of eel) that is baked and given a special sauce ("tare"). Kabayaki is a common Japanese term for filtered food, discarded bone and dipped in soy sauce-basic sauce before roasting on a grill. Eel fish that became the main ingredient of making unagi kabayaki and is a native fish of Indonesia was once found in Japan. Of course not everyone has heard and knows what Unagi Kabayaki is. Unagi itself means eel (a type of eel), kabayaki itself is one way to cook fish in Japanese cuisine, roasted or smoked with coals. In Indonesia or a big city like Jakarta, this type of food is also easy to find, some are intact so you have to clean unagi first, there are also things you can look for in the supermarket in frozen seafood that has been cleaned and cut into pieces. Its thick and soft meat is also rich in protein, calcium, and vitamins. Also, it contains DHA and EPA fatty acids which help reduce cholesterol, blood pressure, and stimulate the nerves of the brain. The meat is soft and tasty can be processed into various menus. If you feel sluggish, consuming unagi also believed to increase stamina. Frozen food itself does not use any preservatives, this method locks the nutrients inside, only need to enter the refrigerator or freezer to stay durable but still healthy. Studies have found that frozen vegetables and fruits can actually be healthier and contain vitamins and antioxidants that make them better than fresh products in fighting cancer. Two studies conducted independently of each other found more beneficial nutrients for the body in a variety of frozen fruits and vegetables including blueberries, carrots, broccoli, and others. Frozen food, on the other hand, is harvested and then cooled immediately or moments later. This means that more antioxidants and vitamins are retained and consumed when you eat them.